When you read through Proverbs, two things happen: First, you find it progressively hard to connect everything together. And second, you keep getting the nagging feeling that you’ve just read that verse somewhere before. Well, it’s not strange. 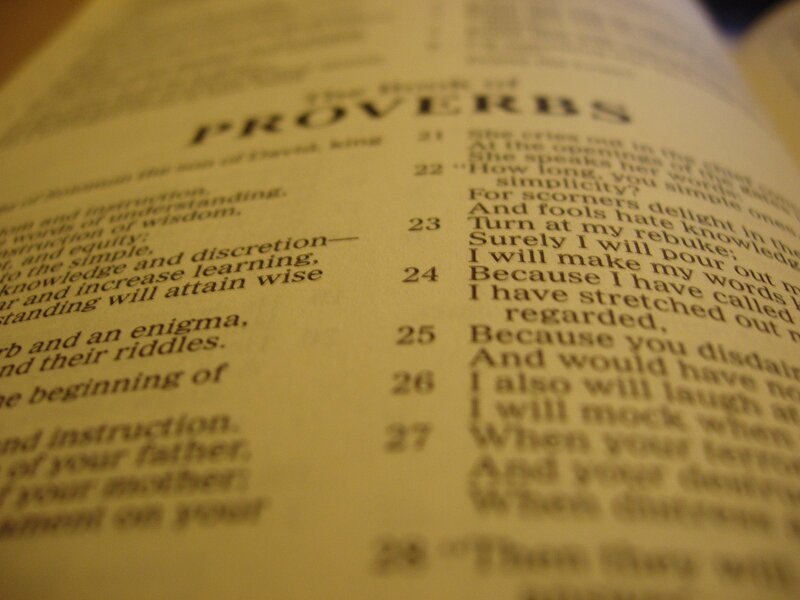 I think that people have always been reading Proverbs in a segmented, or even fragmented way. I’ll never forget when my youth group back in Athens visited someone’s house, and we passed around one of those disturbing “pick a verse” boxes (kind of like a “Christian” fortune cookie). Of the twenty of us, about fifteen ended up with verses from Proverbs, and some of them actually sounded the same, even though they were from different parts of the book. But is that an appropriate way of interacting with Proverbs? It’s a unique book of the Bible, no doubt about that. Even from a superficial reading, it appears that it was not written in one go – it’s more of a collection of “wisdom sayings”, which is why in Hebrew it is referred to as Mishle Shlomoh (Proverbs of Solomon). Interestingly, it’s also regarded as a poetic book – in fact, its official taxonomy within the Tanakh (The Jewish Scripture) is in the third and last section (the Ketuvim, or “writings”), where along with the Psalms and Job it forms the three Sifrei Emet, which we translate as Poetic books. Take a breath; there’s more. Now, there is some ongoing debate as to the author of Proverbs, but the book’s Hebrew title, tradition and the text itself (Prov. 1:1) claim that it’s king Solomon – or at least it’s mostly attributed to him, since the last two chapters (30 and 31) claim to contain the proverbs of two different authors. So, a collection of wisdom in poetry, with rhythm and rhyme. And the fact that it is a collection accounts mostly for the apparent “scattering” of verses in some parts of the book. And yet, like all of God’s Word, Proverbs ultimately comes from one Author (2 Tim. 3:16), and thus we can safely and eagerly look for greater overarching patterns. And here is one that hit me as I read: Proverbs is written for children. Seriously. In no fewer than 23 places, the author speaks directly to his son: 1:8; 1:10; 1:15; 2:1; 3:1; 3:11; 3:21; 4:10; 4:20; 5:1; 5:20; 6:1; 6:3; 6:20; 7:1; 19:27; 23:15; 23:19; 23:26; 24:13; 24:21; 27:11; 31:2. The word for “son” is ben, a common Hebrew word that has its roots in the verb banah – to build or establish a house in the sense of a family. You get the connection. So ben in the context of Proverbs can refer first to the author’s son, but can safely be extended to all those younger than himself. The mental image of Proverbs is of a father lovingly advising his young son. The knowledge of God? Isn’t that reserved for the supreme intelligentsia? The academic elite? The bespectacled, mustached, goatee-stroking, nose-wrinkling, tweed-wearing, elbow-patched Liberal Arts Professor who enjoys reading 19th century German philosophers while on sabbatical at Oxford? It is important to clarify something here. Wisdom (hokmah) in the Bible carries more of a moral sense than we give it in our contemporary thinking. Biblical wisdom involves knowing right from wrong; good from evil; sin from righteousness; what God wants from what He doesn’t want. And ultimately, it is a process; a way of life that leads to a deep understanding of God’s character and of who He is. And according to Proverbs, it is something that even a child can have. So in contrast to our thinking, wisdom in the Bible doesn’t have to do with life experience, learning from mistakes and overcoming our fears. Rather, it has to do with becoming progressively acquainted with God through His revelation to us. We are not called to go out and “find God” as is the current fashion in religious thinking. We are called to obey the God who has graciously found us and has graciously told us how things are. Why? Because obedience to God is the only way to come to know God. And that is something that has nothing to do with our age, education, our IQ, our social skills, our scholarly skills, our understanding of philosophy, our cultural status, our past and present experiences, our trials and tribulations, our friends and family, our personality or anything else that paints the particular picture of our life. Obedience to God is something that we are ALL called to live by (cf. Acts 17:30). And that, harsh as it might sound, is loving grace. Though every one of those points is a blog post in itself, I’ll let us mull over them for a while. Let us be thankful that God has lovingly revealed Himself to us in the Scripture, and that He gives us the means to gaining a wisdom that supersedes any other wisdom in the world. This entry was posted in The Following life, Theology. Bookmark the permalink.